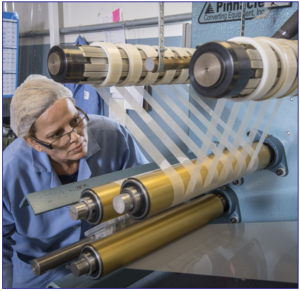 When customers require quality improvements in manufactured thin film components, QDP is the place to turn for the solution. One such opportunity presented itself to us when a customer required the extremely tight tolerances of +/-.005” slit widths in laminated films. Their previous supplier was not able to meet these tolerances at all. One of the first things we did was design and fabricate precision blade fixtures to insure precise spacing of the cutting blades. While that improved the accuracy of the slit widths from lane to lane the quality of the cut itself was still dependent on the standard available cutting blades. As soon as the blades would be slightly worn they would cause the material to track and create variations in the material widths. This required constant changing of the cutting blades and increased labor time. We solved the problem by designing and producing our own proprietary cutting blades which substantially eliminated variations in slit widths and reduced the duration of blade changes. These Blades also enable QDP to achieve a much cleaner cut than our competitors. We practice Continuous Improvement and implement our years of manufacturing experience to refine our manufacturing processes to be as efficient as possible. Are you looking for tight tolerance film slitting? Are your rejection rates higher than you would like? Contact us today to discuss how QDP can solve your problem and provide you with the quality you demand.